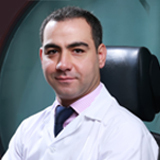 Dr. Khalil graduated from the Medical School of Volgograd Medical Academy in 2002. He started practicing general Medicine in Lebanon before he moved to The United Kingdom, where he completed his foundation in Oxford University Hospitals and held British Board as Medical Practitioner in 2013. He moved to practice in London at Barts Health University Hospitals NHS Trust. His expertise mainly lies with urology and surgical patients with main interest in Andrology. In 2016 started working at International Andrology in Dubai. His main interest lies with managing conditions related to men's health and sexual medicine and andrology patients requiring surgery.